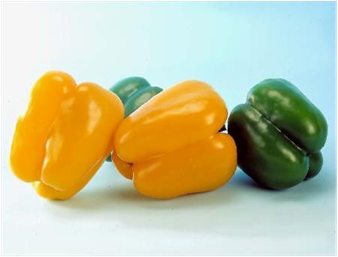 Sweet Pepper | Shneor Seed Co.
Fruit color: green/yellow. Fruit size: 8.5 x 8.2 cm. Fruit weight: 210 gr. Resistances: PVY, Bacteria wilt. Fruit color: yellow. Fruit size: 9 x 8.7 cm, large size. Fruit weight: 200gr. Shape: bell. Uniform maturity, good shelf life. Relative maturity days from sowing: 110. Flesh thickness: 0.6 cm. Number of lobes: mostly 4. Resistance: PVY. Blocky shape, thick flesh, weights about 180 gr. and turns from green to red color. Possible harvesting in long term basis and outstanding keeping quality. 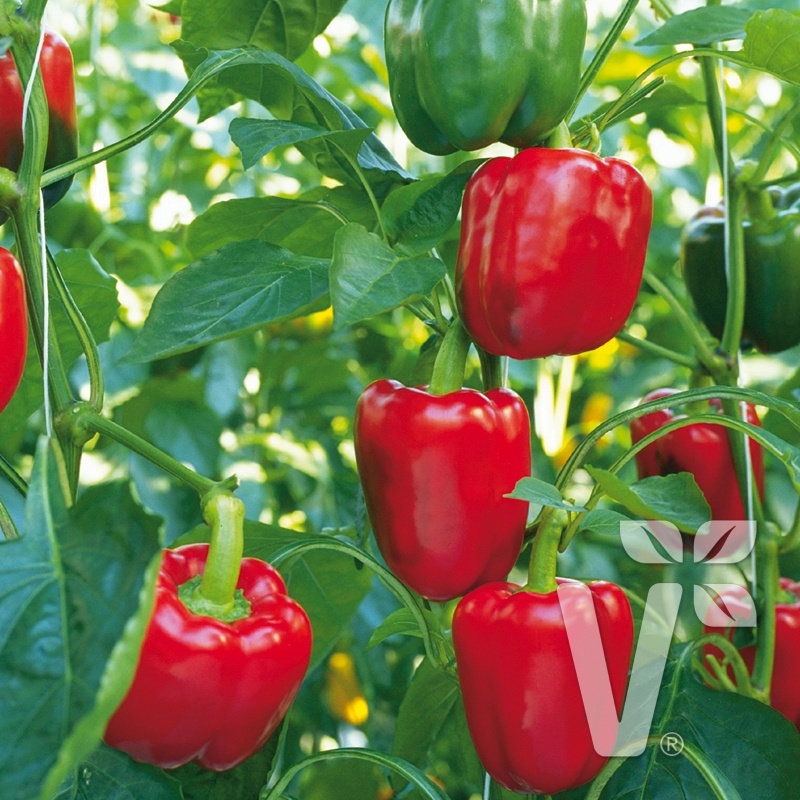 Best to grow in spring for easy harvest. 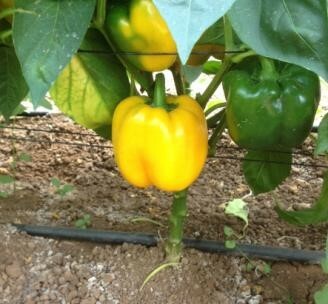 Yellow blocky pepper selected for its excellent characteristics. 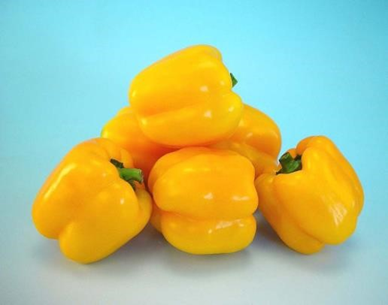 This fruit type yellow square presents considerable size (11x13 cm) thick flesh 10 mm and weight that can reach up to 500 gr. Tolerant to handling and transport. This plant is hardy and vigorous with upright habit, large and good foliage cover that prevents any scalding phenomenon. Medium-early maturing and contemporary cycle. Good behavior even under shelter. Has resistance Tobamovirus (Tm:0-3). Fruit size: 9.1x8.9 cm. Weight: 210 gr. Maturity time: 113 days from sowing. Bell shape. 3-4 lobes. Flesh thickness: 0.5 cm. Charming look. Resistances: PVY, TMV. Lamuyo type. Color: green to red. Thick walls, strong plant. Resistances: L4, TSWV. Bell shape. 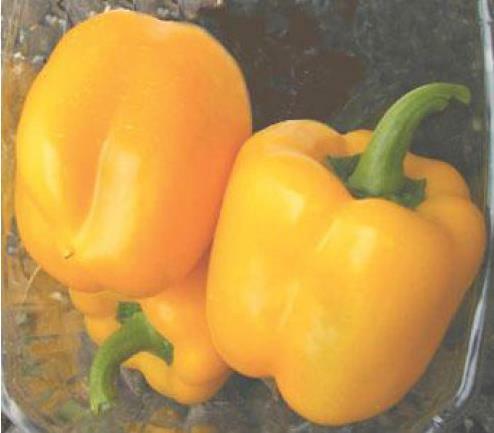 Fruit color: dark green turning into orange at maturity. Fruit size: 9.5 x 8 cm. Weight: 220 gr. Flesh thickness: 0.65 cm. Good for shipping and storage. 113 days from sowing time. Optimal temperature: 20-30°C. 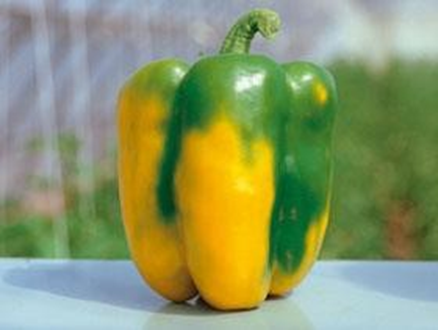 Resistance: Bacterial wilt; medium tolerance to PVY. Compact and strong plant, productive. Fruit color: red. Weight: L-XL. Resistances: L4- TSWV. Strong plant, good leaf cover. 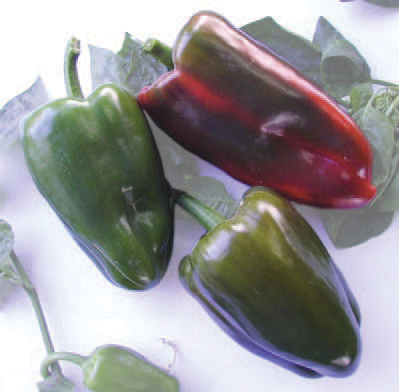 Fruit color: green to red. Fruit weight: 180-200 gr. Relative maturity: medium. 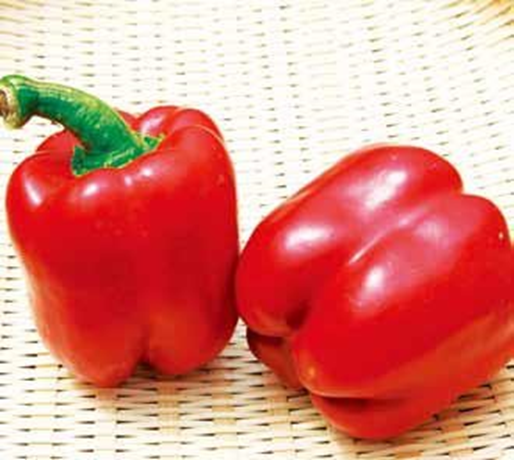 Fruit size: 8 cm in length, 7.5 cm wide. Fruit has medium- thick flesh, good flavor. Resistances: high resistance to TSWV, L3. Type: deep blocky. Tall, vigorous and smooth plant with thick walls. Fruit color: Red. Approximate size: Large to extra-large. Resistances: HR: Xcv 1-5 . Early production of marketable fruit to capture higher prices. Provides steady production of extra-large quality fruit. Very high yield. American type. 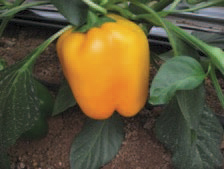 Yellow blocky pepper for greenhouse cultivation. Resistant to TSWV, Tm 0. Fruit size: 8 * 8 cm. Plants are medium in maturity, tall and a little sprawling with large green leaves, vigorous, resistant to TM. Can be harvested 55 days from transplanting. Fruit has elongated bell shape with very sweet and juicy flesh. Its green color turns into red when matures. Fruit size is 15 cm in length and 7.5 cm in diameter and it weights around 230 gr. 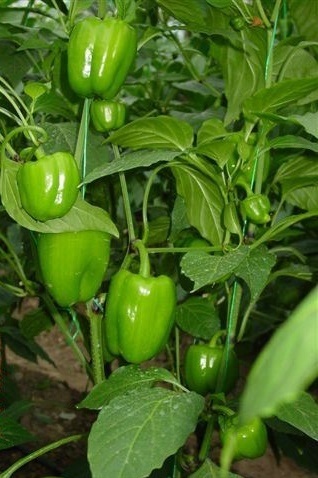 Plants are medium-early in maturity, tall, upright with thick stems and large leaves, very vigorous, resistant to TM. Can be harvested 50 days from transplanting. Very dependable fruit-set under both cool and warm weather. Fruit is mostly 3-4 lobes. 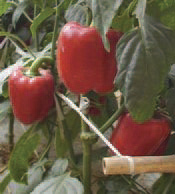 Fruit has large long bell shape. 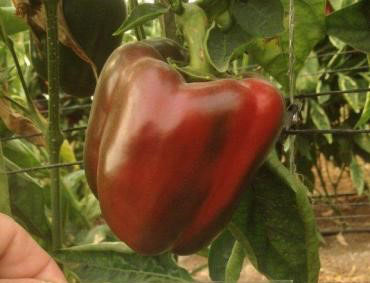 Its dark green color turns into red when matures. Fruit size is 13 cm in length and 7 cm in diameter and it weights 200-250 gr. Fruit color: light green. Size: 8x8 cm. Resistances: TSWV, Xcv. Strong, concentrated set, early production. Strong fruit setting ability. Provides high production of medium size quality fruit in a concentrated set. 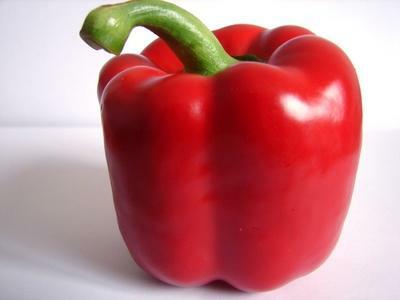 Fruit shape: dolma with thin walls. Color: light green. Size: Medium to large. Strong, vigorous plant. Smooth, blocky shape; excellent quality. Fruit color: Red. Approximate size: Large to extra-large. Resistance: HR: Tm: 0-3, Xcv 1-3 IR: TSWV Early production of marketable fruit to capture higher prices. Provides steady production of extra-large premium quality fruit through the season and to a strong finish. Fruit with great shelf life; strong against pitting and micro-cracking; very desirable for retail market. Dolma type, strong, vigorous plant, blocky with thin walls. Strong fruit setting ability. 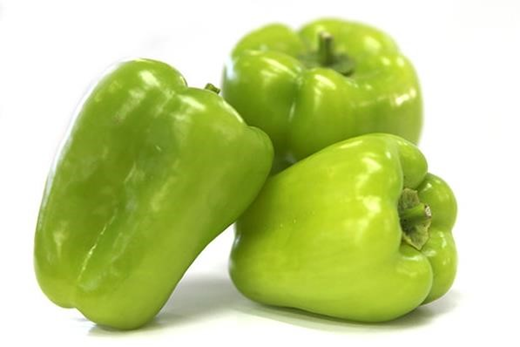 Fruit color: Light Green Approximate size: Medium to Large. Resistances: HR: Tm: 0-3 (L4) IR: TSWV. Early production of marketable fruit to capture higher prices. 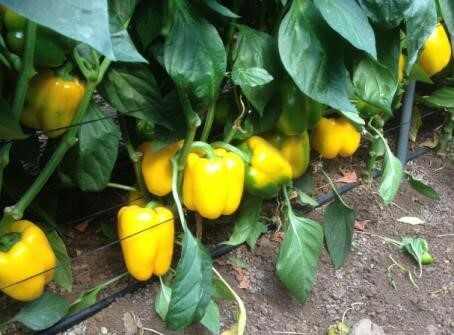 Provides steady production of medium size quality fruit through the season and to a strong finish. 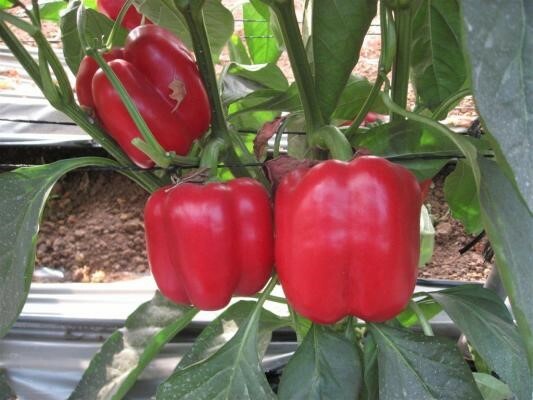 Strong plant, good leaf cover which protects the fruit from sunburn. 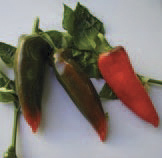 Relative maturity: can be harvested 80 days from planting. Fruit weight: 220-250 gr. Fruit size: 9 cm in length, 8 cm wide. Fruit color: green to red. Flesh: fruit with medium flesh and good flavor. Resistances: High tolerance to TSWV, L3. 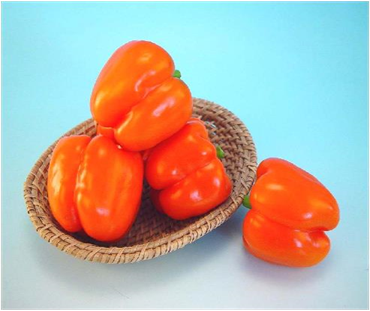 Sweet pepper Hybrid F1 Blocky type. Plant is early-medium in maturity. Small plants with very large leaves which protects the fruit from sunburn. Harvest 50 days from transplanting. Fruit weight: around 180-200 gr. Bell shaped with thick walls and mostly 3-4 lobes. Its green color turns into yellow. Resistant to TMV. Plant is early-medium in maturity. Small plants with very large leaves which protects the fruit from sunburn. Relative maturity: Harvest 50 days from transplanting. Fruit weight: Around 180-200 gr. 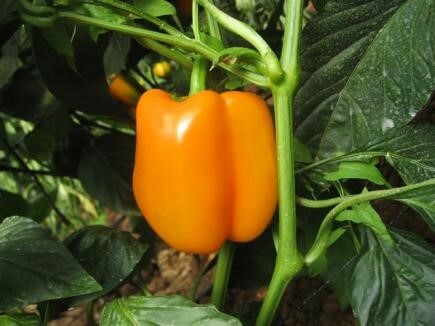 Fruit shape & size: Bell shaped with thick walls and mostly 3-4 lobes. Skin color: Green color turns into orange. Fruit size: half long, 14x9cm. Fruit color: Red. Resistances: Xcv. For open field cultivation. 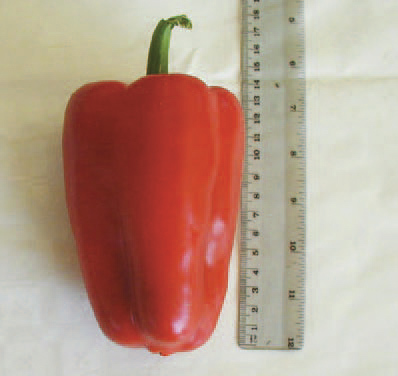 Fruit size: 14-18 cm. For open field cultivation. 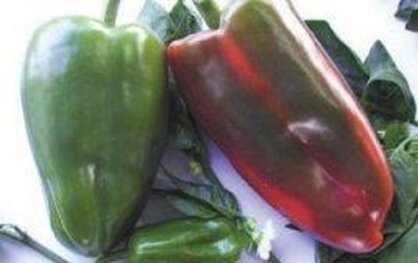 Blocky green to red sweet pepper, thick walls. Strong, smooth, and vigorous plant of excellent quality. Approximate size: large to extra-large. Resistances: HR: L4, Xcv: 1-3, Tm: 0-3 IR: TSWV. Early production of marketable fruit to capture higher prices. Provides steady production of extra-large premium quality fruit through the season and to a strong finish. Fruit with great shelf life; strong against pitting and micro-cracking; very desirable for retail market. 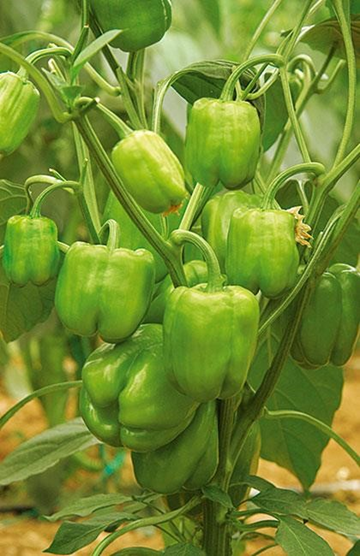 Plant, is early in maturity, harvest 60 days from transplanting.Fruit weight: 80-90 gr.Fruit shape: large elongated.20-24cm long x 3-4cm wide.Color: light green to red when ripe.Resistant to TM, L2.Suitable for net house in summer and greenhouse in winter. 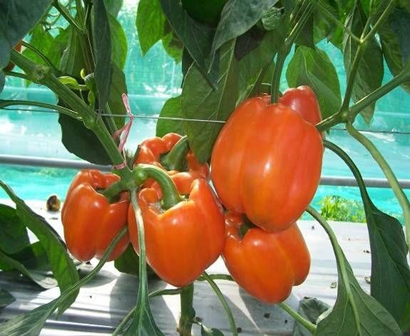 Plant, is early in maturity, harvest 60 days from transplanting.Fruit weight:90-110gr. 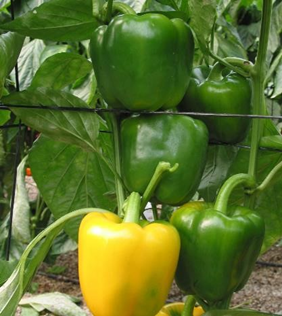 Fruit shape: large elongated.16-22cm long x 4-5cm wide.Color: green to red when ripe. 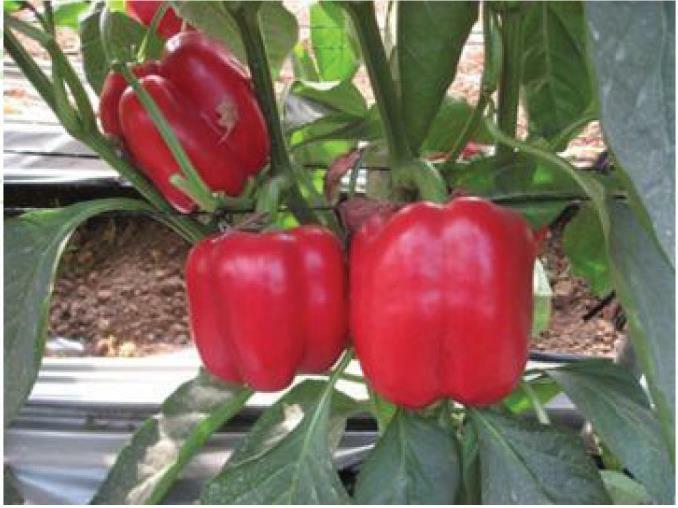 Resistant to TM, L2.Suitable for net house on summer and greenhouse on winter.